We can do what makes us happy. We can focus on what we want. We can fill up our calendars with commitments we have made and things that are important to us – maybe squeezing in a visit to church once in a while. But when something bad happens to us, who do we turn to? Who are we suddenly calling on to help us? Now that this terrible thing has landed on our doorstep, we want God to get involved. We want him to listen. 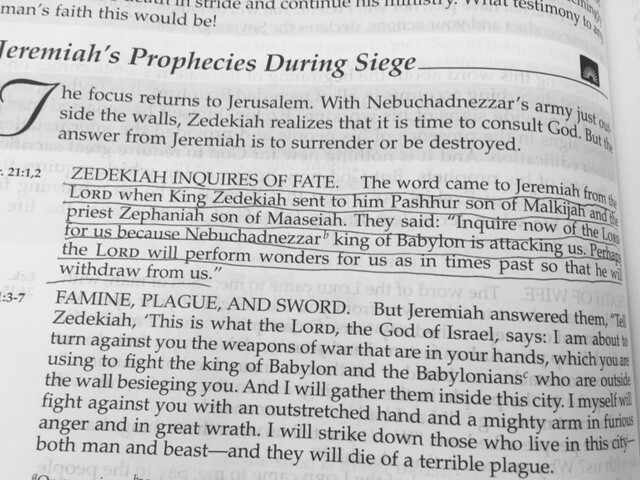 Unfortunately, sometimes it can be too late like it was for King Zedekiah in Jeremiah 21. The king had rebelled against King Nebuchadnezzar which was not very smart. Zedekiah’s army was like an ant facing the giant, fierce lion of Nebuchadnezzar’s army. When this roaring lion of an army showed up outside of Jerusalem’s city walls, Zedekiah finally decided it was time to consult with God through Jeremiah. God said it was too late. God had set his plans of punishment for the people’s years of sins in motion and everything was going to be destroyed. The good news is that God no longer punishes believer for their sins. Jesus paid the price for all of our sins – past and future – on the cross. When I read the Old Testament, I am reminded what an awesome gift that is. The Holy Spirit now lives inside of us – leading us into truth and life. If we take the time to listen. If we decide to obey. We are no longer punished for our sins but God does let us experience the consequences of our bad decisions. He disciplines and teaches us as any good father would do for the children he loves. We decide how many consequences we’re going to experience by how many decisions we make without consulting God. We choose how many messes we will create when we choose to do things our way instead God’s way. Of course, sometimes things happen to us just because we live in a sinful world. They are not a consequence of our choices. But God can still use these situations to grow us and mature us if we’re listening. If we’re submitting to him and obeying. God is telling us that, either way, its much better to be listening and obeying daily than to wait until we have a roaring lion of a mess in our lives. Please help us listen and obey, Abba Father. Thank you for the miracle of your grace in our lives.